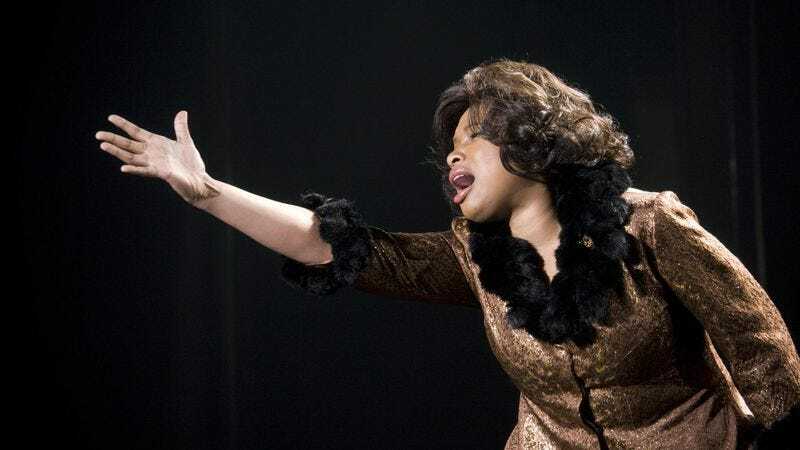 According to The Wrap, Jennifer Hudson is in early talks to play Aretha Franklin in a biopic that’s being developed by Straight Outta Compton producer Scott Bernstein. The Wrap cites the ever-trustworthy “individual familiar with the project,” as well as a report from The Tracking Board, both of which apparently came upon this information separately. Nothing official has been decided yet, but one of Hudson’s representatives did confirm to The Wrap that “conversations have taken place,” so that might as well mean that this is happening. The Franklin biopic—which doesn’t have a title yet, even though Respect is sitting right there—will reportedly follow “her rise to fame in the ’60s and ’70s” as well as “her relationship with her abusive ex-husband Ted White.” The biopic will also feature a lot of singing, which means having a famous musical artist like Hudson on board would be a huge plus. Well, that and the fact that she won an Oscar for Dreamgirls.